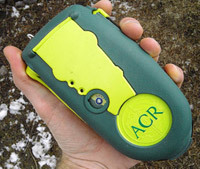 This is an ACR GPS Personal Locator Beacon, or “PLB” for short. It is my safety net when I go out solo on long backpacking trips. Here’s how it works: If I had an accident that left me unable to walk out of the wilderness, I extend the antenna and press the button to activate the help signal. An internal GPS receiver acquires my GPS coordinates and the PLB transmits them along with my personal identification code through satellites to an NOAA station (National Oceanic and Atmospheric Administration). The NOAA station then calls my emergency contacts (friends and family phone numbers that I’ve registered beforehand) to ensure that I am indeed out in the wilderness and it’s not a false alarm. They then contact the local Search and Rescue team, which would initiate a rescue operation – knowing my exact location. I’ve taken the PLB on several week-long solo trips where I spent numerous days in remote basins far away from trails. If I got hurt in these places, I might not be found for days, or weeks, if at all. In these situations, I must admit that having the PLB gave me a great peace of mind. It is a noticeable comfort to know that I have some kind of safety net… some kind of connection to civilization. After all, no matter how much of a “mountain man” I think I am, I know that accidents can happen to anybody – that’s why they’re called accidents. And I’m sure that if something went wrong, any romantic illusions of braving the wild or being one with nature would quickly fade away as the severity of the situation sank in. As you can see in the picture, this thing is pretty large, and it is heavy. It’s like putting a small brick into your pack. I’m sure that in the next several years PLBs will get smaller and smaller. Who knows, maybe cell phones will come equipped with this feature someday in the not too distant future (along with full coverage anyplace on the planet). But for now I do believe it’s worth the extra weight. P.S. – Regardless of the technology in your pack, you should ALWAYS tell someone your plans and expected return date, in case all else fails. Posted in Gear on April 1, 2008 April 2, 2008 by Jack Brauer. I know several people who are using them. Hey Paul, yeah I just saw a link to that the other day. The SPOT looks like a great product. It is significantly cheaper than the ACR and has a few extra features too. I would really consider that one if I didn’t already have the ACR. Thanks for the heads-up on both of these products Jack and Paul. This is the type of thing I could use as well! Yes Erik, the pressure is on! That’s why I’m posting about my personal locator beacon. LOL! When an individual (or group) is in distress, activating a PLB results in a 5W 406MHz signal being transmitted. The distress signal is received by the SARSAT (Search and Rescue Satellite Aided Tracking) system which uses NOAA satellites in low-earth and geostationary orbits to detect and locate the source of the signal. Initially, the geostationary satellites detect the distress signal and actual location of the transmitting PLB is then determined using Doppler technology from the low-earth satellites. The distress information is provided by NOAA to the AFRCC (Air Force Rescue Coordination Center) in Langley, VA. Encoded in the transmitted signal is a serial number which is used to determine the registered owner or renter of the PLB device. The initial location information is determined in 10-45 minutes and is accurate to within about 2 miles anywhere on earth. The second pass improves the accuracy to within about 300-400 yards. Some PLBs have a built in GPS and upon acquiring a signal from GPS satellites transmit location information accurate to about 100 yards within minutes. In addition to the 406MHz transmitted signal used by the SARSAT satellites, PLBs also transmit a 121.5MHz homing signal that is used by Search and Rescue teams to locate the person in distress once they get close to the location provided by the SARSAT system.